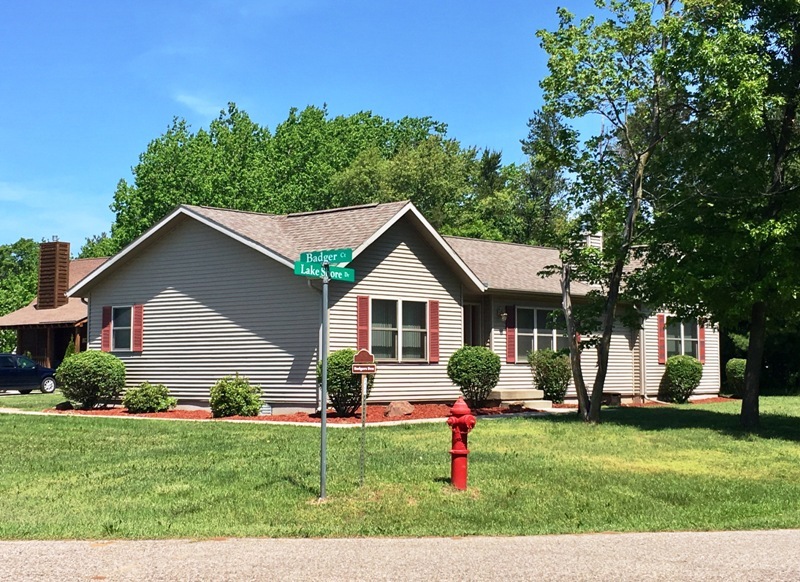 Situated in a popular cul-de-sac within Spring Brook Resort, this beautiful ranch home boasts a finished lower level with a game room, four large bedrooms and three full bathrooms. Guests will relish spending evening downtime enjoying the large deck with table and chairs, gas grill, and an in ground fire pit – perfect for summer bonfires or winter cookouts with the family. Badgers Den accommodates a maximum of 14 people. The main level offers a master bedroom which provides a king size bed, TV/DVD and private bath with a jetted soaking tub. The additional two bedrooms are furnished with queen size beds and share the full bathroom which is also accessible from the common area. Load up on groceries for added savings and convenience. The fully furnished kitchen reflects the comforts of home with a full size refrigerator, microwave, oven and dishwasher. Enjoy your morning donut at the breakfast bar which provides counter space for meal prep and additional meal seating. It opens to the living/dining room which provides meal seating for six, a TV viewing area, queen sofa sleeper and a cozy gas fireplace. A large utility room with washer and dryer adds to the conveniences afforded to guests of this home. The beautifully finished lower level offers a fourth bedroom (queen bed) and a third full bathroom. The real treat though is the spacious family fun room which has seating for the big game (two queen sofa sleepers), a wet bar including a mini fridge and bar stools, a pub table, a pool table and a foosball table. Perfect for hosting every sporting event from football Sundays to March hoops! Be prepared to disconnect over a board game, catch up on some reading or enjoy card night with the gang as this home does not provide internet access. This home is pet friendly – maximum of two dogs, sorry no cats allowed. Badgers Den is centrally located within the resort and offers easy access to Spring Brook’s Clubhouse, which is home to the Spring Brook Sports Bar & Grill, indoor/outdoor pools, fitness room, golf course and pro shop. Home sleeps maximum of 14, rates based on 8 people over the age of 3. Extra guest fee of $15/night per additional guest applies. Security Deposit of $500 required.